There are many influences the Mediterranean diet offers and therefore many types of salad – but a good Mediterranean salad should be able to conjure up the sun, sea and a sense of relaxation. Below you will find some classic combinations to whet those summer taste-buds and which also make fabulously easy dinner recipes. The secret of success for this kind of a salad is to use produce at its freshest and when it is naturally in season. This way, you can be certain of good flavour. Also, salads are best served at room temperature rather than still icy from the fridge, and if using a dressing, leave a little time for it to marinate and for the flavours to develop. 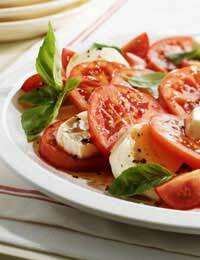 For this salad, use either large Spanish beef or firm Italian plum tomatoes. Make sure they have been naturally ripened on the vine if possible for the fullest flavour, or even better, grow them yourself! If you can’t find them, don’t worry, any standard tomato will work. Slice the tomatoes and mozzarella and lay alternately in a dish with freshly picked basil leaves tucked in between each layer. Drizzle with good quality virgin olive oil and season with salt and freshly ground black pepper. Simple but sumptuous. Another heavenly combination is avocado and olives. Choose a large, just-ripe avocado and carefully peel and remove the stone. Cut into slices and arrange in a dish together with ripe, cherry tomatoes at room temperature, baby salad leaves and rocket. If you can’t find rocket, then watercress will also work quite nicely here. Then sprinkle in some pitted black olives and grated parmesan cheese before dousing with virgin olive oil. For this typical Greek salad, take one green pepper and a cucumber and cut into strips, removing the seeds as you go. Then slice a small red onion together with some good salad tomatoes, cut into wedges, and add them to the bowl. Finally, break some Feta cheese into the salad and add a scattering of black olives – removing the stones if needs be. A variety of Greek olive such as those from Kalamata would be authentic. To make the dressing, dissolve a pinch of salt into three tablespoons of white wine vinegar. Then gradually whisk in about 5 tablespoons of olive oil and continue to whisk until creamy and smooth. Season with oregano and pepper and pour the dressing over the salad. Then leave to marinate for between 30 and 60 minutes to allow the flavours to develop. This salad is a version of a Tuscan salad, based on locally grown, sun-ripened produce. Peppers are very easy to grow yourself, but if time, space, energy or sunshine are lacking, then they are easily available at all supermarkets as well. First of all, mix together a splash of balsamic vinegar with a couple of tablespoons of red wine vinegar and two tablespoons of water. Pour over some cubed white bread – enough to absorb all the mixture after about 15 minutes. Next gather together sweet peppers in a variety of colours – yellow, orange, red and green and remove the stalks and seeds. Then, using about half of each, dice or cut into thin strips, as preferred. Add one small salad onion and if you like them, a few capers. Finally, add the soaked bread cubes to the salad and make a dressing of 2 parts red wine vinegar to 4 parts virgin olive oil, season and garnish with fresh basil. These salads can be eaten on their own, or for a more substantial meal, with fresh bread or a Mediterranean fish or meat dish such as grilled sardines, souvlaki, chargrilled chicken or lamb kebabs.